Home Subscriber Only Cover Story Does Rhode Island have right approach on food waste? Does Rhode Island have right approach on food waste? COMPOST CENTRAL: Jayne Merner Senecal, owner of Earth Care Farm in Charlestown, the largest commercial-scale licensed composting facility in the state, with Jeff Glover, farm support, who is holding a grabber and bucket that he uses to clean the piles of unwanted items. Tucked in a residential neighborhood of mostly rural Charlestown is the state’s largest commercial-scale compost-processing facility. Second-generation Earth Care Farm owner Jayne Merner Senecal, whose family has farmed and produced compost on the 27-acre property for 41 years, prides herself on the enterprise’s “high-quality soil amendment” – and the proof is visible. Garlic, rhubarb, strawberries, asparagus, dill and other vegetables abound in the family’s garden adjacent to the manufacturing facility. 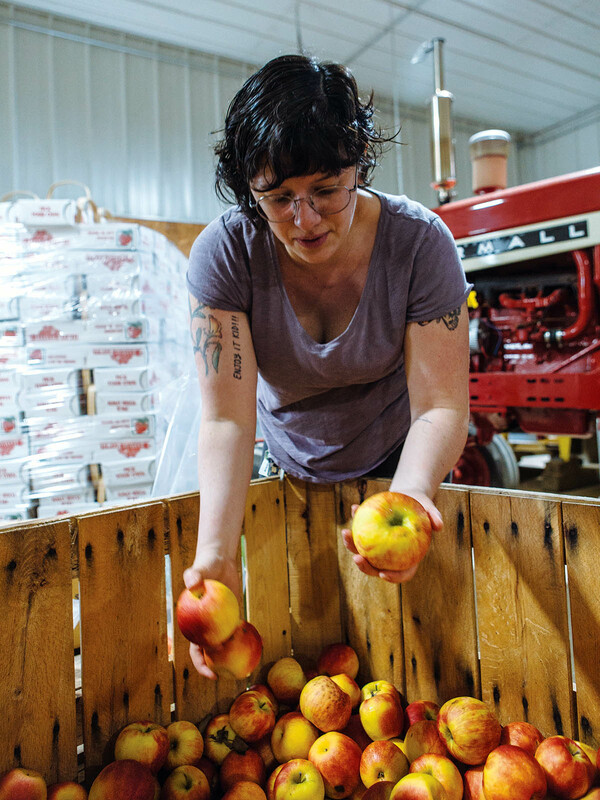 The farm, almost by default, has become a key player in the state’s 2016 food-waste ban put in place in part to ease pressure on the state’s lone landfill, in Johnston, that’s nearing capacity. “Of the 50 to 100 tons of compostable material brought to Earth Care Farm each day, 3-5 percent is food waste,” she said. With a Johnston-based 3.2-megawatt anaerobic digestor – equipment that uses microorganisms to break down organic materials into multiple forms of usable energy – mostly offline, the farm is the sole Rhode Island facility at which large-scale food-waste producers can divert such materials, as directed by the ban. 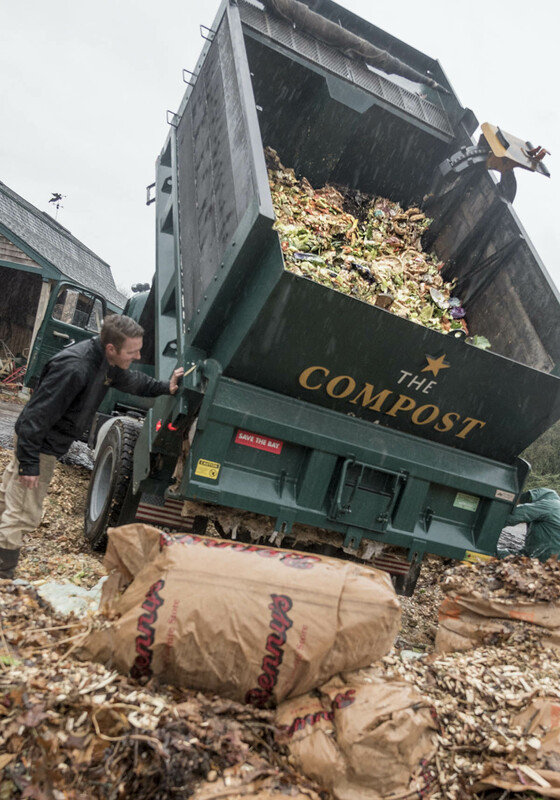 In 2016 the farm took in approximately 1,000 tons of food scraps. In 2017, a year after the ban took effect, Earth Care accepted approximately 1,500 tons of food scraps. 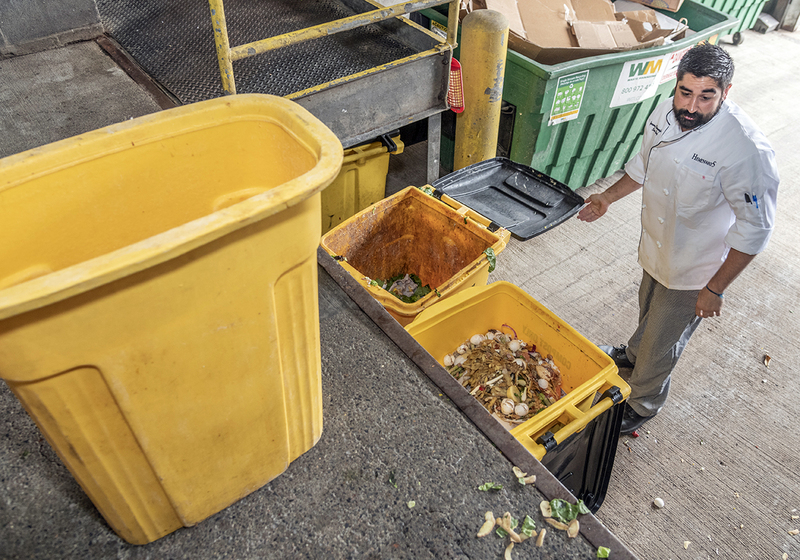 The latter, however, is expected to drop this year due to a limited number of haulers willing to pick up separated food scraps from schools and businesses and bring them to her facility, Merner Senecal says. In a state with a national reputation as a foodie haven, 10 percent (108,800 tons) of all waste accepted at the Central Landfill in 2015 was food waste that could have been diverted to composters such as Earth Care Farm or the anaerobic digester owned by Charlotte, N.C.-based Blue Sphere Corp., according to a 2015 study commissioned by the R.I. Resource Recovery Corp., which manages the landfill. Jared Rhodes, RIRRC director of policy and programs, says 40 percent of the 108,800 tons of food waste accepted in 2015 was commercial in origin. Merner Senecal is happy to play her part in support of the state’s ban but knows a lot more needs to be done to create a stable food-waste diversion industry and help extend the life of the landfill. “If there were three or four facilities this size in Rhode Island,” she said of her composting operation, she believes all food waste in the state (including residential) could be kept out of the landfill. So far, however, the state has been unable to attract enough facilities to effectively enforce the ban, which targets large-scale producers of food waste. As a result, “The easiest thing for [businesses] to do right now is stick it in the trash,” said Sue Anderbois, the state’s director of food strategy. Under current R.I. Department of Environmental Management permits, RIRRC estimates the landfill will reach capacity in 2034. “Sixteen years is not a long time” in the life of a landfill, said Rhodes, adding, “It can take up to a decade to permit a new landfill,” and none is on the docket, by his count. “Every opportunity we have to save space … is a valuable one,” added Rhodes. The state is hardly alone regionally in trying to manage food waste and landfill capacity. Connecticut’s Department of Energy and Environmental Protection found in 2010 that food waste accounted for 13.5 percent of the state’s total waste stream. The Nutmeg State passed a ban similar to Rhode Island’s in January 2014 requiring food-waste producers of 104 or more tons per year located within 20 miles of the state’s seven permitted recycling plants to “ensure” those materials are recycled. Of those seven licensed facilities, as of October 2017, one anaerobic digestor has been online since December 2016, while two additional anaerobic digestors are under construction and a fourth is planned. The state’s three other licensed processors – non-anaerobic digesters – are operational. As of April 2017, there were 17 active landfills in Connecticut. The state, however, could not provide dates as to when the facilities would reach capacity or cease accepting materials. In 2014, the Mass. Department of Environmental Protection began to oversee a commercial food-waste ban on companies that produce 1 ton or more per week. As of July 2017, per MassDEP data, food waste accounted for an average 17 percent of the state’s total waste stream. As of October 2017, the Bay State was home to 45 food-waste diversion sites – five of which are anaerobic digesters, including one in New Bedford. Massachusetts is also under considerable landfill pressure. In a 2016 report, the Mass. DEP found, of the state’s nine active landfills, permitted capacity would be hit in 2018 at the Carver, Chicopee, Dartmouth and Southbridge facilities, with the remainder reaching permitted capacity by 2024 or earlier. However, five of those landfills have “potential additional capacity” for between one and 10 years. He fears that only when the landfill hits capacity will there be an urgency in government to review the efficacy of current policies and procedures. Those efforts, however, have so far done little to create the necessary infrastructure in the state to make a dent in the state’s own commercial production or get Rhode Island on a path to reaching federal goals of cutting food waste in half by 2030, according to state officials and several small businesses in the industry. There were high hopes for the move to divert food waste from the landfill with legislation that was passed in 2014 and went into effect Jan. 1, 2016. However, affected entities are exempt if they fall outside a 15-mile radius from such a facility or if such a facility within the radius does not have availability. Earth Care Farm lies outside the 15-mile radius for most of the largest food-waste generators in the state, and the Johnston anaerobic digestor has been mostly offline for retrofitting since fall 2017, according to Merner Senecal and Leo Pollock, co-owner of Providence-based The Compost Plant. DEM could not say when the Blue Sphere anaerobic digester went online, but according to its records, construction began in 2015 and licensure for the facility was issued on Nov. 15, 2017. Per DEM’s discussions with the facility’s owners, a DEM spokesperson said “at least another year” is expected until the facility reaches full operational status. Blue Sphere’s Rhode Island managers did not return requests for comment. Gray, who recently visited the facility, said it is online but accepts “limited” materials. He expects it to be fully functional in six months to a year. Gray said there were “a few proposals on the table” from Blue Sphere and NEO Energy out of the gate, but only one was built. NEO, out of Portsmouth, N.H., he said, “got right to the finish line” and, for unknown reasons, dropped its bid for a Quonset Point facility in North Kingstown. But Gray isn’t ready to give up on the ban’s “market-based solution,” and suggested “it’s too soon to tell” if it will work. To better facilitate industry growth, Gray said he would like to see a “signal from the industry” outlining the types of support and structure needed. “You hear it anecdotally, but it would be great to see [an industry] come in and say, ‘There’s no place to go [with food waste] and no way to get it there,’ ” he said. 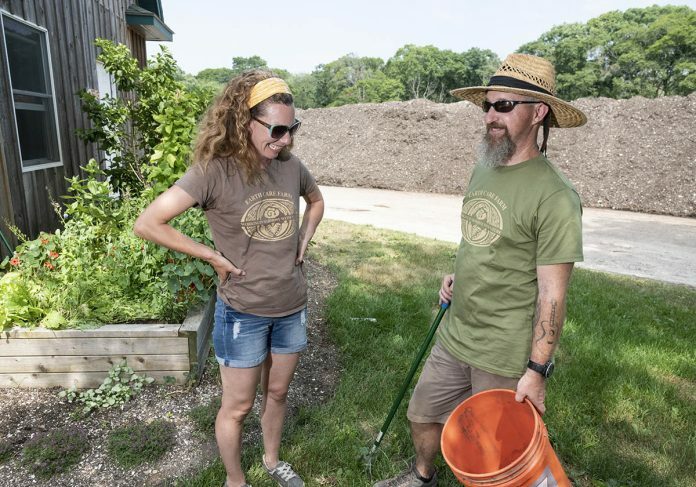 After working in urban agriculture and biodiesel replacement, respectively, Pollock and Nat Harris founded The Compost Plant. 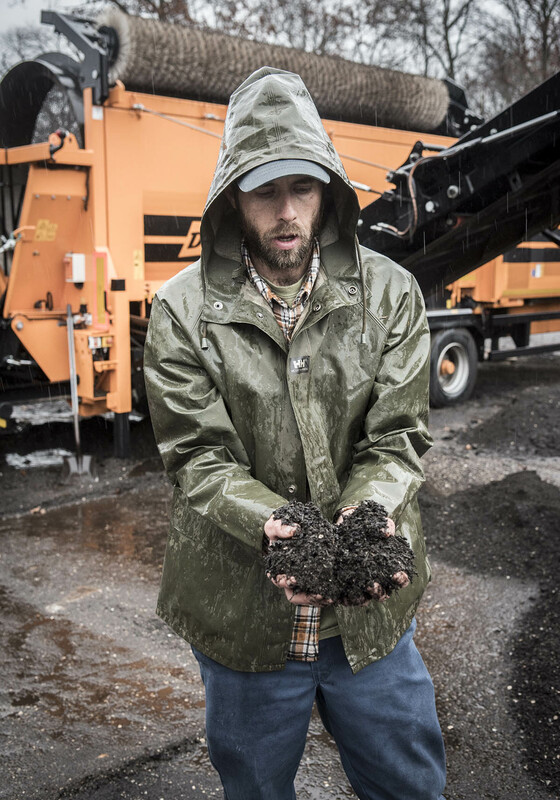 The 5-year-old firm juggles three main components – waste hauling, compost processing and retail sales of Rhody Gold compost – from a North Smithfield farm and its Providence headquarters. A year before the ban’s passing, seeing “real potential,” Pollock said he knew the state “didn’t have the infrastructure … to divert, haul and process food waste” and tried to help address those needs. While he thinks the ban has led to “increased awareness” about the problem of food waste, he says it is flawed. He agrees, however, infrastructure doesn’t exist in Rhode Island to support large-scale food-waste diversion from the landfill, noting his company has been forced to rely on Massachusetts-based waste processors to stay in operation. If a waste company can contract a cheaper price with an out-of-state processor, says Gray, they’re allowed to dump there. State law, however, mandates state contractors dump at the landfill as a “guaranteed revenue stream,” he added. “I don’t see [the lack of permitted processors] as the responsibility of the state,” said Pollock. “The market is not moving quickly on its own. “It’s a tough economic model,” said Pollock, explaining a customized truck costs $120,000. While Gray argues the ban was designed to encourage anaerobic-digestor investment, Pollock believes Rhode Island’s best bet is decentralized waste management. “Big facilities aren’t the right solution for us,” he said, pointing to small companies already making an impact. By Anderbois’ count, there are “a handful … not more than 10” businesses with food-waste diversion focuses. An out-of-state consultant with whom Anderbois has worked, Lorenzo Macaluso, director of client services for the Northampton, Mass.-based Center for EcoTechnology, identified eight diversion businesses: one composter, one animal feed facility, one anaerobic digestor, one food-waste hauler, one food-rescue organization and several technology platform services participating in the local industry. Earthly, a 4-year-old, Providence-based compost company selling directly to cannabis growers, expects to be in the black this year. Co-owner Frank Mastrobuono, however, remembers when the company was struggling to secure funds from local investors. Food-waste-related firms need funding to grow, yet “access to capital in Rhode Island is really poor,” he said. “If we want to see more of these [food-waste] diverters, we need to see them as good business models and invest in them,” he said. And it will take patience to build infrastructure, Mastrobuono says. “While it may also be totally appropriate to be impatient [waiting for a] project, given how dire the need for landfill space is, the problem can only be addressed so fast,” he said. Rather than anaerobic digestion, Hope’s Harvest Rhode Island founder Eva Agudelo calls for increased support of composting sites such as Earth Care Farm, which, she said, is “in line with natural processes and feeds back into the food system.” Her nonprofit “gleans” – collects unharvested or unsold but still edible fruits and vegetables – from local farms and redirects those resources to pantries. Launched June 1 by three University of Rhode Island alumni, Rhodeside Revival out of South Kingstown provides a receptacle for customers to measure food waste and a curbside pickup service. Co-founder Brendan Loflin said Rhodeside Revival’s biggest challenge remains signing up customers. “Everyone is excited, but getting people to do it is the biggest hurdle,” he said. Tobey Sanborn, general manager of Hemenway’s in Providence, says his business has voluntarily complied with the state’s ban, even though it doesn’t apply to the restaurant, he said. All food plates are broken down into three waste bins: compostable materials, metals and solid waste. More than half of Rhode Island’s colleges and universities – URI, Roger Williams University, Brown University, Rhode Island School of Design, Rhode Island College and Johnson & Wales University – this year participated in a semesterlong collaboration with the state utilizing tracking software to measure food-waste generation. JWU, with one of the nation’s top culinary programs, is looking to continue studying and educating students on the issue. Bill Idell, JWU’s College of Culinary Arts assistant dean, prides himself on graduating students who care about their communities, as well as their kitchens. Food-waste awareness at JWU starts during orientation, when students are educated about what can be diverted and shown multiple bins – compost, garbage, plastics recycling, thin plastics recycling and fats – available in each classroom to do so. Portion size, produce rotation, accurate prep and guest lists, and ordering best practices are covered in various JWU curricula as well. Spearheaded by the R.I. Department of Health, Rhode to End Hunger is another program coordinated by the state. It encourages the donation of “potentially wasted food” by food-production companies before it becomes inedible or thrown out. Feedback from potential donors said the greatest “barrier” to donation was navigating complex DOH guidelines. In response, Anderbois, with DOH, produced an easy-to-read, two-sided document outlining food-donation guidelines in simple terms. Available on RIDOH’s website, it stipulates what types of foods can be donated, introduces firms to a nationwide donation database and explains good-faith liability protections. Getting DOH involved, Anderbois said, was key. “It’s not just me saying it’s important to donate. It’s [DOH] saying this can be done safely and you won’t get in trouble,” she said. David J. Bordieri, RIRRC waste-prevention coordinator, says the agency has offered waste prevention and recycling program assessment to businesses for nearly 18 years. Bordieri has been at the helm for the past 12 years. A “one-man-show,” Bordieri said he’s worked with manufacturing, retail and hospitality companies but wishes more people knew about the service. Earth Care’s Merner Senecal says that for the state’s ban to eventually take hold among businesses, they need to see it as beneficial – both environmentally and financially. Forcing companies to comply, she said, means composters “end up getting more trash,” increasing their processing time. Like recycling-awareness campaigns of the 1990s, Merner Senecal knows food-waste diversion will take time to instill, but she is optimistic. Gray agrees. He doesn’t believe the state’s efforts to date have been “a failure” and applauds the work of involved businesses. While he could not confirm details, Gray is looking forward to September when DEM, with the U.S. Environmental Protection Agency, will host a workshop on how to advance existing efforts and increase the volume of materials diverted from the landfill. “Even though you don’t have strict compliance right now,” the state’s ban “has moved the needle in terms of awareness and planning,” he said.